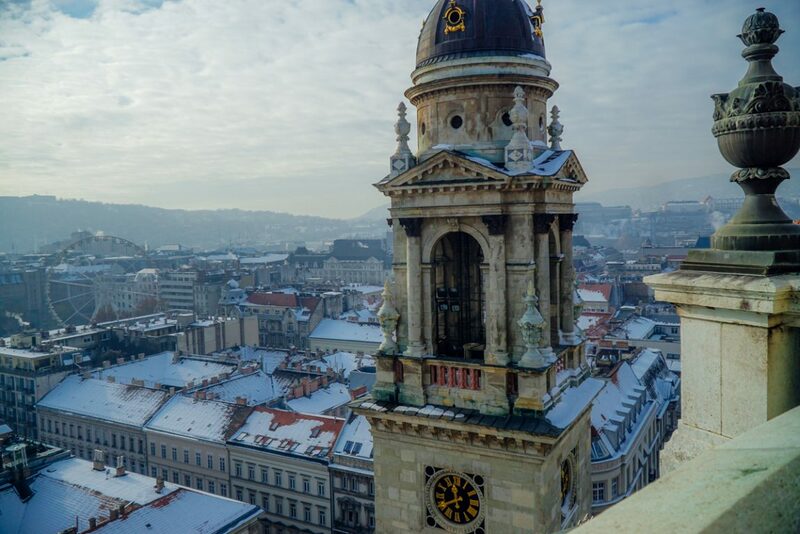 From the adorable Christmas market stalls selling steamy lángos and flaky, cinnamon-flecked chimney cakes to warming up in thermal waters amidst a lightly falling snow, experiencing Budapest in winter is a dream come true. I first fell in love with Budapest when I stayed there for two weeks last July, making the most of the long summer days despite the intense heat. After that visit, Budapest clawed its way firmly to its spot as one of my favorite cities in Europe. On my second visit to Budapest in December, I confirmed it deserved its spot in my mind as one of the best cities in Europe. In fact, I’d even venture to say that I think I liked winter in Budapest just a touch more. What can I say, this already-gorgeous city is absolutely perfect when dusted with snow! And when the cold got to be too much, hearty Hungarian food, tasty wine, and delicious coffee were never far from reach. 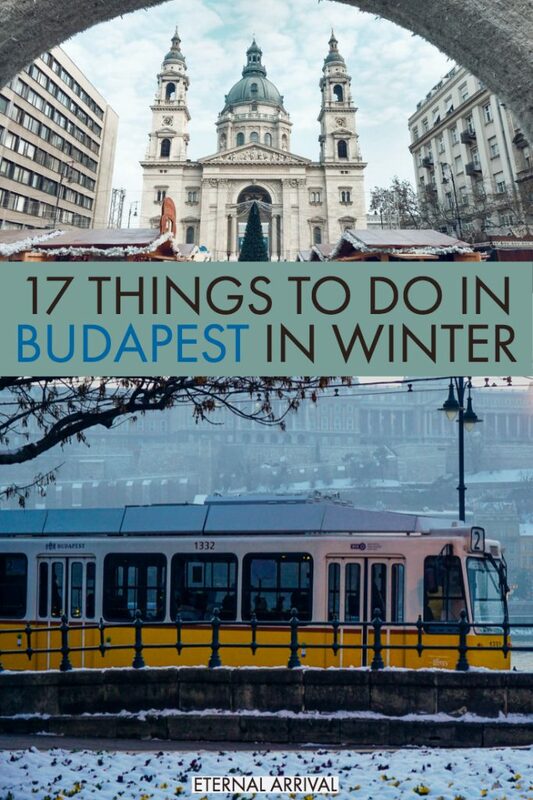 If you’re planning a winter trip to Central Europe, here are my favorite things to do in Budapest in winter. Every year, the Budapest Christmas markets open around the middle of November and go strong until around December 31st (or in the case of the Basilica market, until the 2nd of January – check exact run times here). 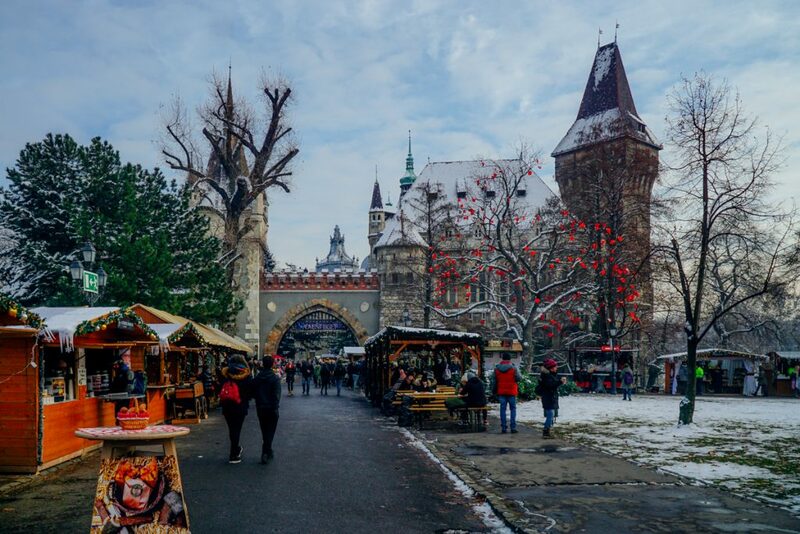 Other Christmas Markets in Europe close on December 24th, so in the event you’re planning a winter Europe trip for late December, Budapest is a great choice as the winter markets will still be going strong for about a week after Christmas. Better yet, the Budapest Christmas markets have been named one of the largest and most affordable Christmas markets in Europe. 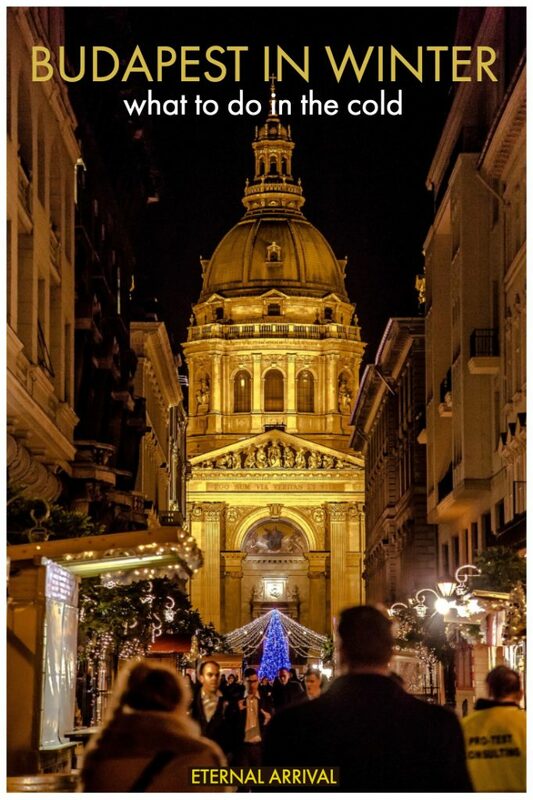 If you’re looking for a dreamy Christmas in Europe getaway that won’t break the bank, Budapest is perfect. I definitely found this to be true, as accommodations in Budapest in December were surprisingly affordable even during the peak travel time in the week before Christmas. The largest and oldest market can be found at Vörösmarty Square, which started running relatively late compared to many Christmas markets around Europe, in 1998. There are concerts and performances here throughout the Christmas season, from jazz to soul to folk music, running from 5 PM to 8 PM on weekdays and 4 PM to 8 PM on weekends. There is another large market around St. Stephen’s Basilica, radiating outward for a few blocks and seeming to merge with the Vörösmarty market. 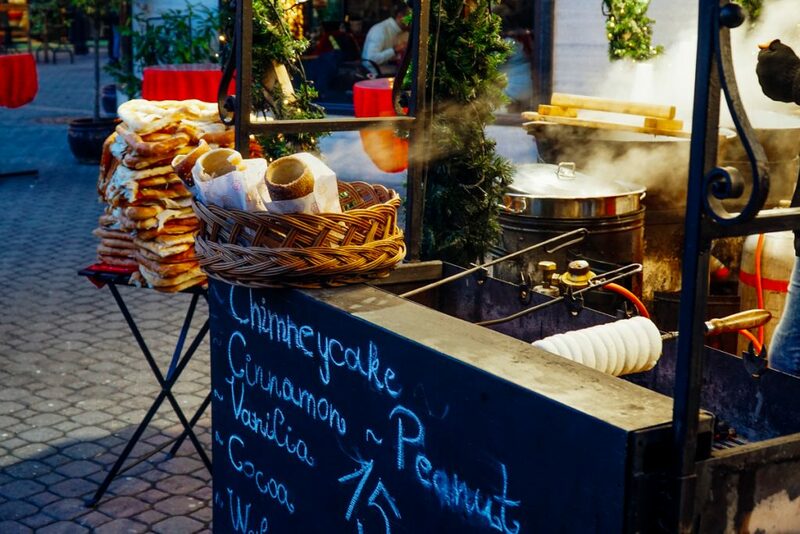 Don’t miss trying Hungarian chimney cake, called kürtőskalács. You actually may recognize this from Prague markets, where it’s called trdelník and is decidedly not traditional! This Budapest Christmas classic is a specialty of Hungary, where it came to the country from Transylvania (which once was part of Hungary). You can’t miss tasting it when in Budapest in winter – it’s extra delicious to tear into while it’s still steaming hot. However, the markets in Vörösmarty Ter and in front of St. Stephen’s are far from the only Christmas markets in Budapest. There are several smaller ones throughout the city – the cutest of which is located at the foot of Vajdahunyad Castle in Budapest’s City Park. 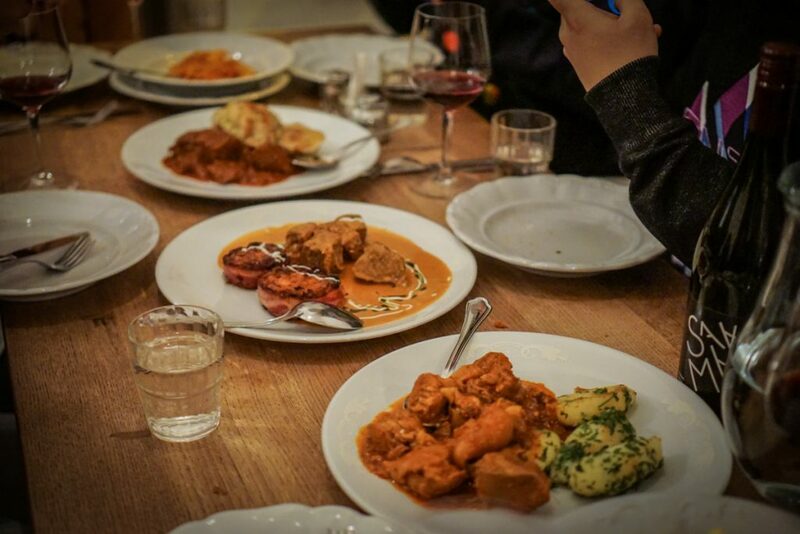 Full of soups and stews and rich, warming ingredients like paprika and lard, Hungarian food is simply made for winter. When I visited Budapest in December, I went on a dinner walk with Taste Hungary, and it was easily my favorite thing I did on my entire Budapest winter trip. 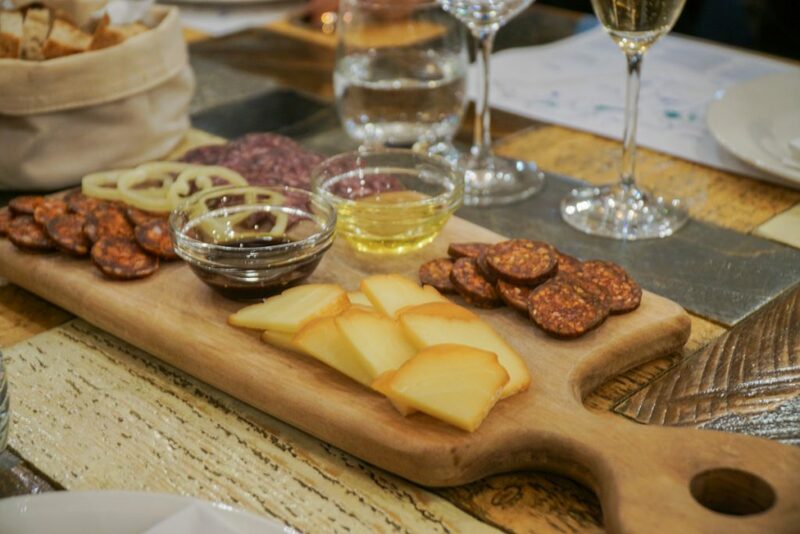 We started off at their wine room, the Tasting Table, where we tried a sparkling Hungarian wine and a still red wine called Kékfrankos and snacked a few types of sausage: beef, water buffalo, and a pork sausage with plum jam (soooooo good). There was also a fantastic Slovakian-Hungarian smoked cheese called parenyica. Everything went perfectly wtih the Hungarian wines, which are seriously some of the best wines you’ve probably never heard of. I’m a serious wine geek, and Hungary’s wine scene is lit. But don’t fill up here – there are several stops after this! 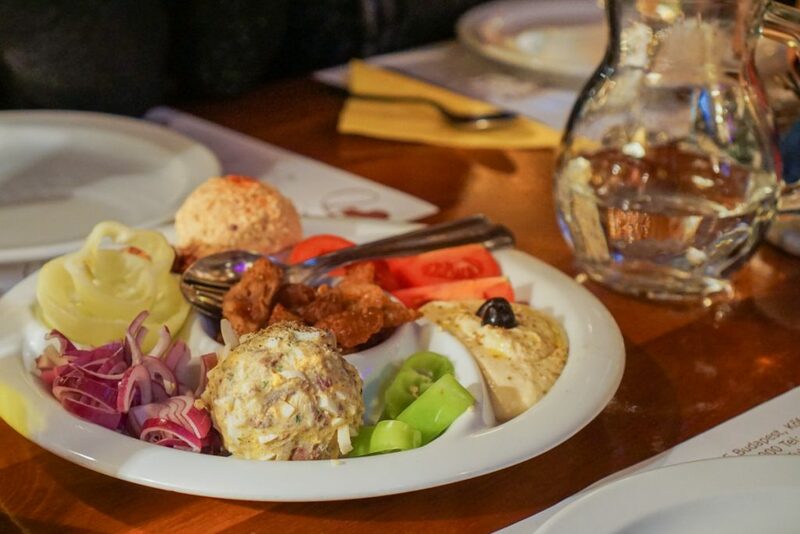 Afterwards, we went to a Jewish-Hungarian restaurant, where we tried hummus, a “Granny’s Jewish egg” made of chopped goose liver, egg, red onion, and lard (that sound you hear is my heart trying to beat over all that artery-clogging), kőrözött (cottage cheese with paprika and onion), and goose cracklings (OMG DELICIOUS). 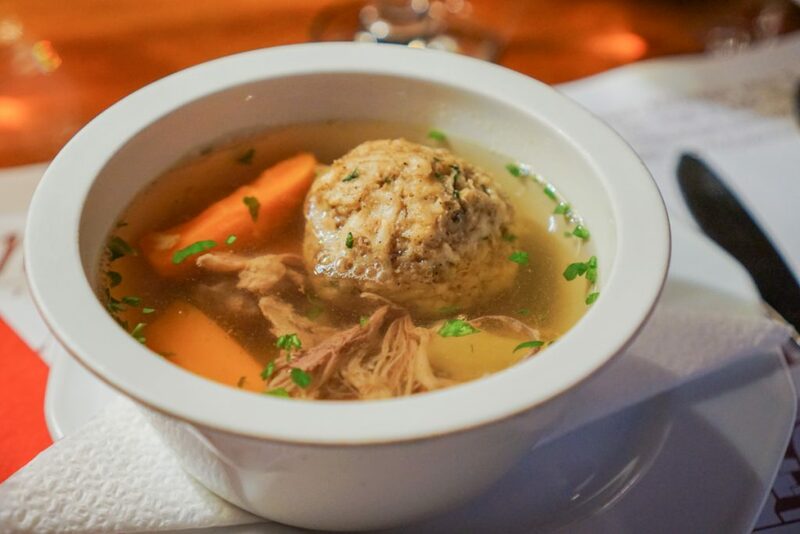 We also got our choice of soup; I opted for a matzo ball soup because you can take a girl out of New York but you can’t take New York out of the girl, and others went for the bean gulyás (goulash). Oh, and that was just the starter. Next, we walked to Szimpla Kert, the largest and most famous ruin pub, where we tried raspberry pálinka and learned a bit about the history of the ruin bars for which Budapest is so famous. Afterwards, we had a fantastic group dinner, which included chicken paprikás, veal paprikás, pörkölt (a venison stew), a pork knuckle stew, and lecsó, a thick vegetable stew. But my favorite part of it all was a side dish: a baked curd cheese noodle dish wrapped in bacon that will forever haunt my dreams until I return to Budapest. Finally, we stopped to taste two of Budapest’s most famous cakes, the Eszterházy (walnut) and Dobos (chocolate), right next to the beautiful Hungarian State Opera. I nearly needed to be wheeled out of the restaurant afterwards. The best part of doing a food tour like this is that you get to try more food than any reasonable human would ever get to taste, perfect for FOMO-havers like myself (and even better when you’re traveling solo and have no travel companion’s plates to mooch off of). Food tours are one of my first ports of call when visiting a city, and I’m so glad I explored Budapest’s food scene more deeply. While Budapest’s thermal baths are lovely any time of year, they’re especially enjoyable as a respite from the biting winter weather. 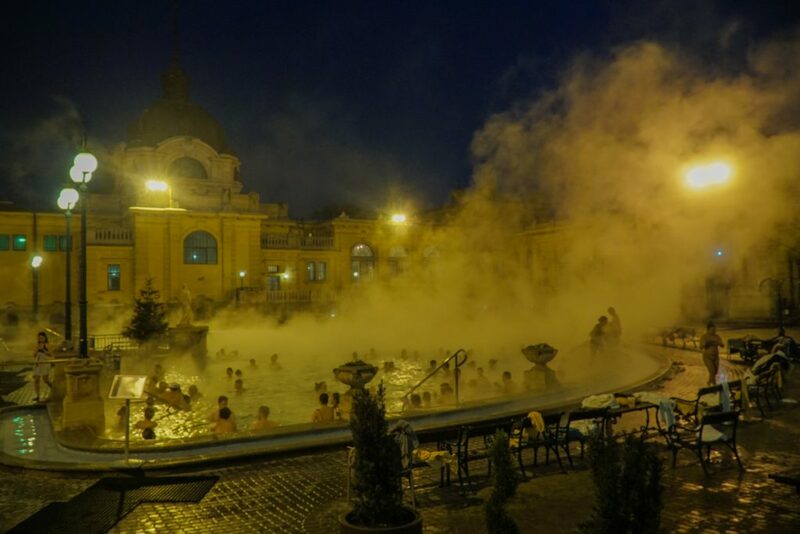 In the winter, I think the outdoor area of Széchenyi is the best of the thermal baths, as it has the largest and warmest outdoor pool area. I love the outdoor pools as you can really feel the contrast of cold air on your face and the warm water all around you – it’s so relaxing. 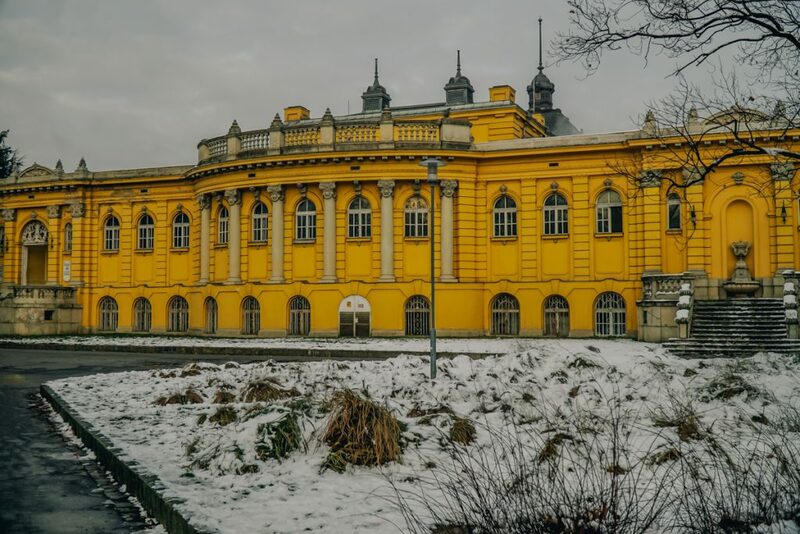 A quick history lesson: Széchenyi was built in 1913 and was the first thermal bath in Pest, in a gorgeous yellow Neo-Baroque building that screams to be Instagrammed (seriously, the pool is like one giant #followmeto shoot). The baths are composed of 18 indoor and outdoor natural geothermically heated pools ranging from around 30º C to 40º C (86º F to 104º F). The saunas are especially enjoyable in the winter, but be sure to drink plenty of water and skip the beer or wine being sold on premises if you are making use of the sauna, as you can easily get quite dehydrated! I didn’t drink enough water while there and ended up with a nasty headache… so learn from my foolishness and do as I say, not as I do. If you’re feeling like a baller, you can even add a massage for about 70 euros. If you have limited time, I recommend spending an evening unwinding at the baths, and saving your daylight hours for exploring the others sights of Budapest. The sight of steamy water lifting into the dark night sky off the mineral baths is so relaxing and beautiful! However, if you prefer indoor thermal baths, I think Gellért’s are the most beautiful. 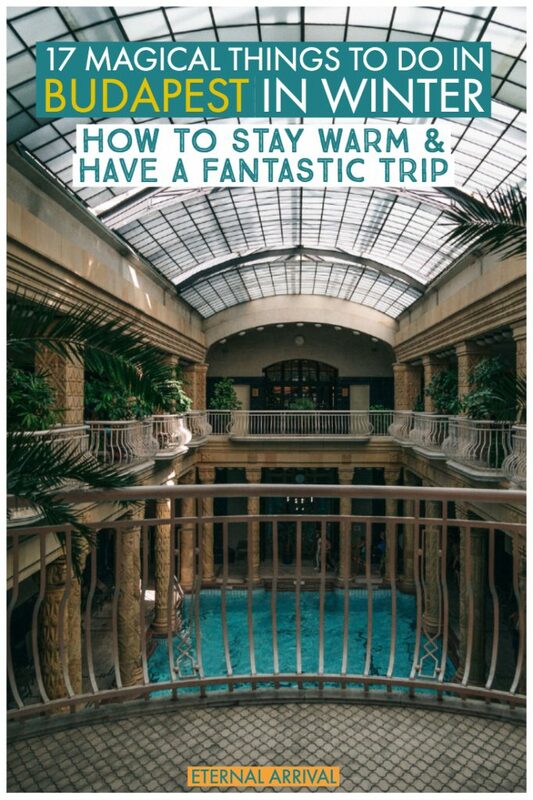 With gorgeous Art Nouveau architecture and stunning blue tiled interiors that are unlike any other building I’ve seen before, Gellért is a wonderful place to while away a blustery Budapest winter day. Opened in 1918, the Gellért Baths on the Buda side of the river are part of Hotel Gellért, though anyone can purchase a day pass to use the baths. The Gellért complex has several rooms with heated pools of different temperatures as well as saunas and massage rooms. There are other thermal baths as well which are a bit more off the beaten path, such as the Rudas Baths which have a gorgeous outdoor bath overlooking the Danube and one of Budapest’s eight bridges – swoon! I haven’t personally been to these baths yet, but they are next on my list after seeing gorgeous photos of the views. No matter which you choose, all the baths use naturally geothermic water chock full of minerals like calcium, magnesium, chloride, sulfate, and fluoride, which are all purported to have magical, anti-aging, skin-refreshing benefits. Be sure to bring your own swimsuit, flip flops, and towel or you’ll have to rent or buy them… which is not cheap. I forgot to bring flip flops (I mean, in my defense, who packs for Central Europe in winter thinks to bring flip flops?) and had to pay like $15 USD for a single use pair which gave me sad-looking blisters on my toes. Budapest’s coffee scene is booming, with a handful of delicious third wave and specialty coffee shops popping up around the city. 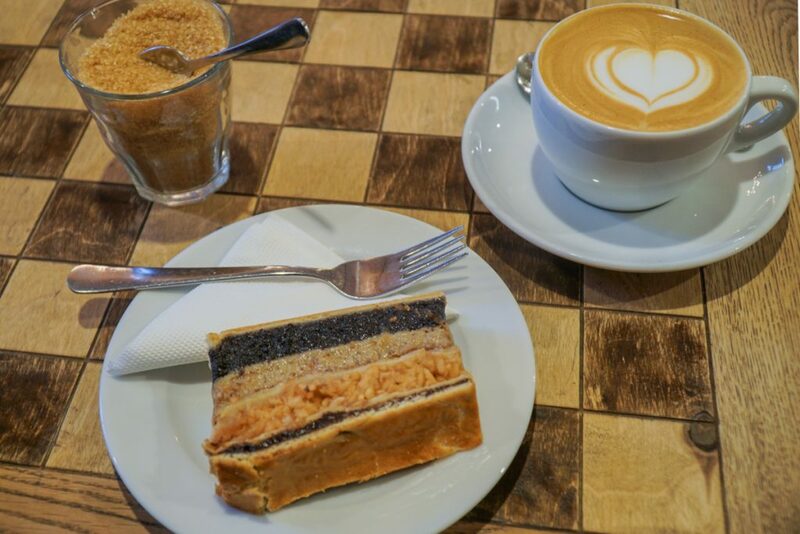 I tried a few during my stay, the best of which were Apricot Coffee in the Palace District and Espresso Embassy in District V.
I especially loved the delicious flódni cake at Espresso Embassy. It’s a traditional Jewish cake composed of layers of walnut, poppy seed, fruit jam (usually plum or apricot), and spiced apples. It’s beautiful to look at and even better to taste! Espresso Embassy is also a great place if you find yourself needing to work on your trip. I spent a few hours here catching up on e-mails and it was a great atmosphere for it, with fast wifi and a creative, buzzy vibe without being too loud. 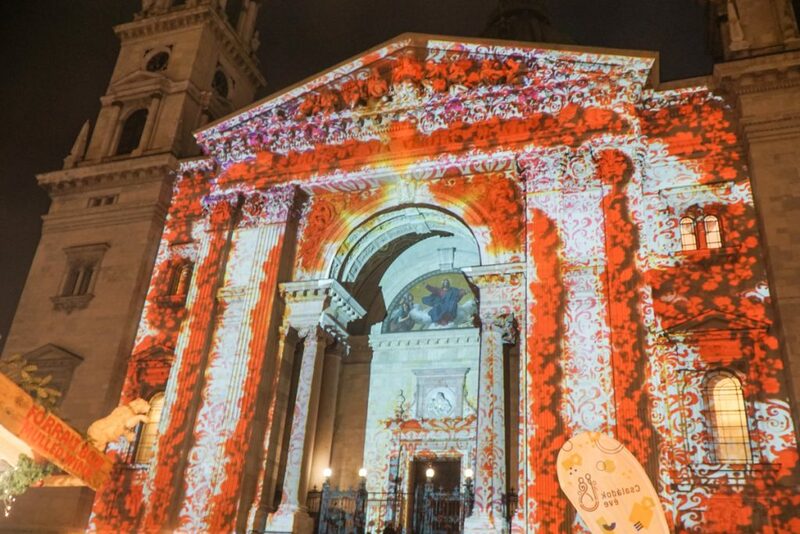 If you are traveling Budapest in December before the markets close, you’re in luck – you won’t miss the spectacular light show which gets projected onto the face of the St. Stephen’s Basilica! This quirky light show is rather magical to watch dance across the white building face of the Neoclassical basilica. It plays every 30 minutes (on the hour and half past the hour) after dark, so you’ll have plenty of chances to catch it. It runs from roughly the last week of November until the end of December, in concordance with the Christmas market in the square. Apparently the show is actually watchable in 3D, and you can get glasses somewhere at the market! I had no idea and just watched it without the glasses (3D glasses make me nauseous anyway) and found it enjoyable. The light shows have been going on since the first Christmas market at the Basilica in 2011, and are now a beloved part of a Budapest Christmas. 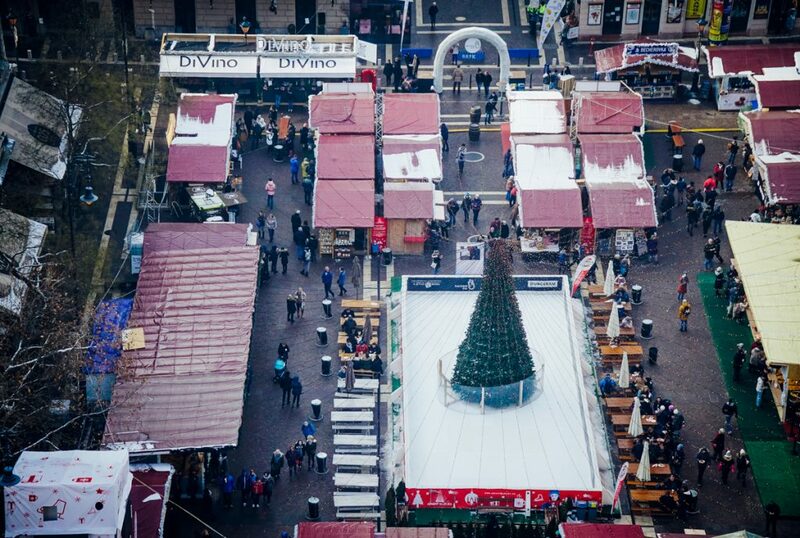 The Christmas market in this square also has a small ice rink for children, delicious food and drink options (don’t miss the mulled wine – a great way to warm up in winter!) and handicrafts on sale. While you shouldn’t miss the light show, be sure to also go inside earlier in the day and see the beautiful interior, which is open from 10 AM to 4 PM each day in winter. It’s free to enter but a donation is recommended to keep this basilica looking beautiful. Even better, don’t miss the opportunity to go up to the top. The panoramic tower, which costs 600 forint or about $2 USD, is open until 6 PM, so it’s possible to get a photo of Budapest’s Christmas markets all lit up and glittering in the night. I went here during the daytime and it was magical, but I’ve seen photos at night that are even more spectacular! There are two elevators so if stairs are difficult for you (or you’re really lazy, like me) you can take these up, although note that you will still have to climb some stairs so it is not accessible for those with mobility limitations. The Vajdahunyad Castle is beautiful all year round, but it’s fairy-tale-level magical coated in snow. While it may look old, looks are deceiving and the castle has an interesting origin story. It was first built in 1896 for a temporary exhibit celebrating 1,000 years of the Hungarian state, made of cardboard and wood. However, it was so beloved that it was made into a permanent stone and brick castle in 1908. The castle’s look is particularly distinctive as it contains copies of several buildings from different eras of Hungary’s rule – the most notable of which was copied from the Hunyad Castle, one of the most beautiful castles in Romania (remember, Transylvania was once part of the Hungarian kingdom!). This mishmash contains elements of Romanesque, Gothic, Renaissance, and Baroque styles, creating one crazy-interesting castle. It’s home to the Museum of Hungarian Agriculture, which is the biggest agricultural museum in Europe. Since I’m not really an agriculture nerd (what, you neither?) I just walked around and enjoyed the beautiful castle grounds, particularly the adorable Christmas market stalls around the entrance. 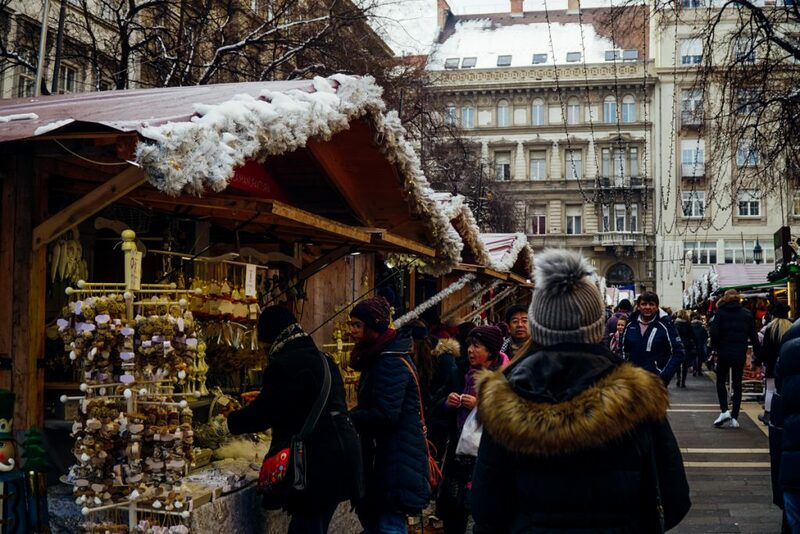 If you’re visiting Budapest in January or February, you’ll miss the Christmas market here, but it’s still well worth visiting regardless – especially as it’s close to the ice skating rink and Széchenyi baths, two other Budapest winter musts. The biggest ice skating rink in Budapest, and indeed the biggest outdoor ice rink in all of Europe, you shouldn’t miss ice skating in City Park on the lake in front of Vajdahunyad Castle at Varosligeti Mujegpalya. In the spirit of full disclosure, I made a massive travel blogger fail: I thought it was closed when I went, but it was actually just taking its daily break… whoops. The hours vary a bit, but here is a rough estimate of the schedule: 9 AM to 1 PM, a 4-hour break, then from 5 PM to 9 PM on weekdays and 10 AM to 2 PM, a 2-hour break, and then from 4 PM to 9 PM on weekends. So if you go in the middle of the day like I stupidly did without researching it first… you will be disappointed! Tickets cost 1000-1500 HUF (about $4-5 USD) on weekdays and 2000 HUF (about $7), plus an extra cost for skate rental (800 HUF or about $3 USD per hour), so it’s a pretty inexpensive way to enjoy Budapest in winter. 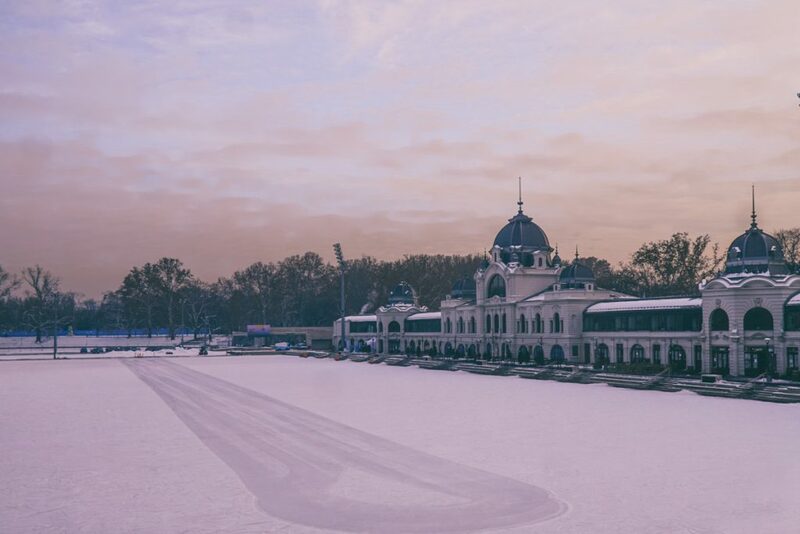 There are a few other ice rinks in Budapest, like the teeny-tiny ice rink in Basilica Christmas market or the smaller Obuda Christmas Market, but neither come close to the size or beauty of this ice rink. 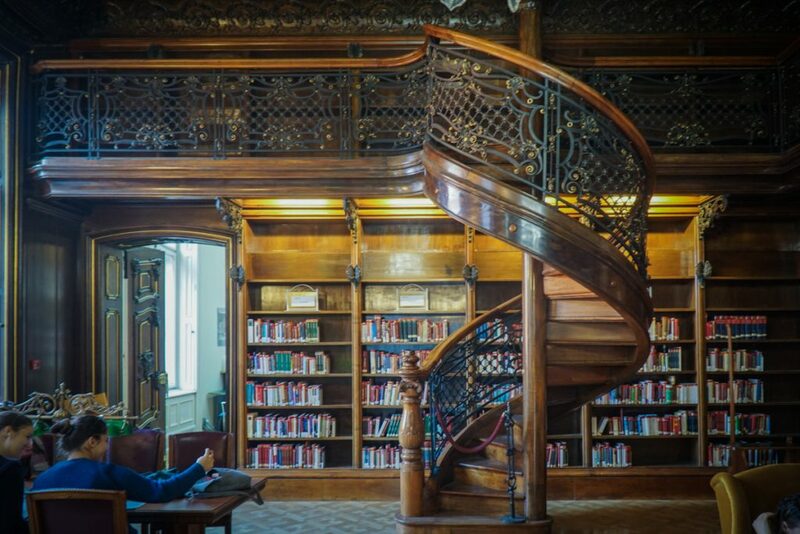 Hidden in a dull-looking modern library, this gorgeous 19th-century aristocrat’s mansion has been converted into a stunning library for all to enjoy. The rooms have been preserved beautifully, showing the elegance of turn-of-the-century interior design and providing a window into the life of its original owners, the wealthy Wenckheim family. It was purchased by the City Council in 1931, who converted the palace into reading rooms for a library. It can be a bit confusing to find the actual library so first find the information desk (you may need to be redirected to someone who speaks English). There, you can pay a small fee – I think it was about 600 HUF, around $2 USD, cash only – for a small slip of paper which will grant you admission to the library on the 4th floor. Signs will then direct you to the library. 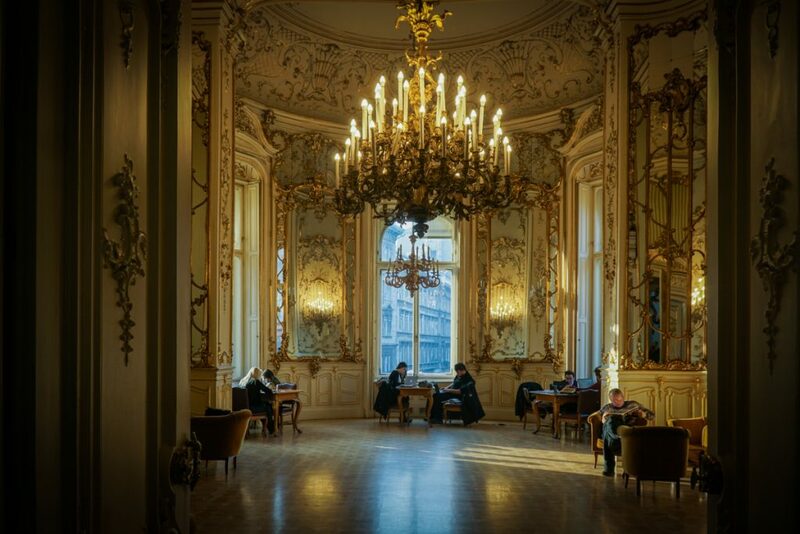 The rooms are simply gorgeous, and you’ll find locals with laptops studying or lolling about in the su-filled rooms with a book in hand with beautiful Neo-Baroque architecture everywhere you look. If you have time, find a seat and curl up with a book (I’d recommend bringing your own rather than trying to find one) and while away a few wintry hours here! It’s open every day except Sunday, from 10 AM to 8 PM (4 PM on Saturdays). I don’t know what it is, but as soon as winter hits, I find myself shunning beer and drinking wine all winter long – white, red, sparkling, it doesn’t matter, I’m into it. Luckily, Hungary is an under-the-radar wine powerhouse, producing some of the most stellar wines I’ve ever tried… and that’s high praise as I grew up just outside Napa County – I’m certainly no stranger to good wine! 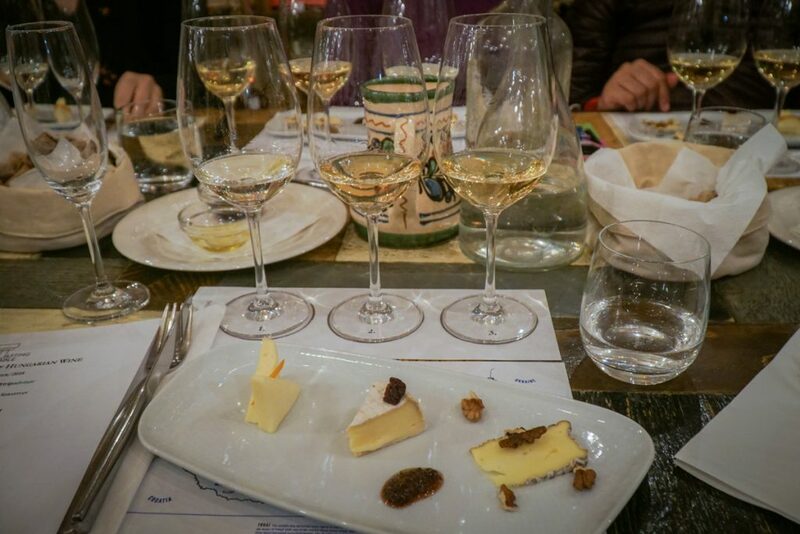 If you have time during your Budapest winter trip, I highly recommend doing a wine tasting class at the Tasting Table with Taste Hungary, the same company I went on my food tour with. At the wine tasting class, you’ll try eight wines – one sparkling, three white wines, three red wines, and one Tokaji dessert wine. All the tastings are led by a sommelier, so even if you don’t know much about wine (Hungarian or otherwise) beforehand, you’ll have learned a ton by the end of the two hours. The sparkling wine was a magnificent welcome, but the white wines afterwards stole the show – I think this is where Hungarian wine shines the brightest. It was fantastic paired with three local cheeses. 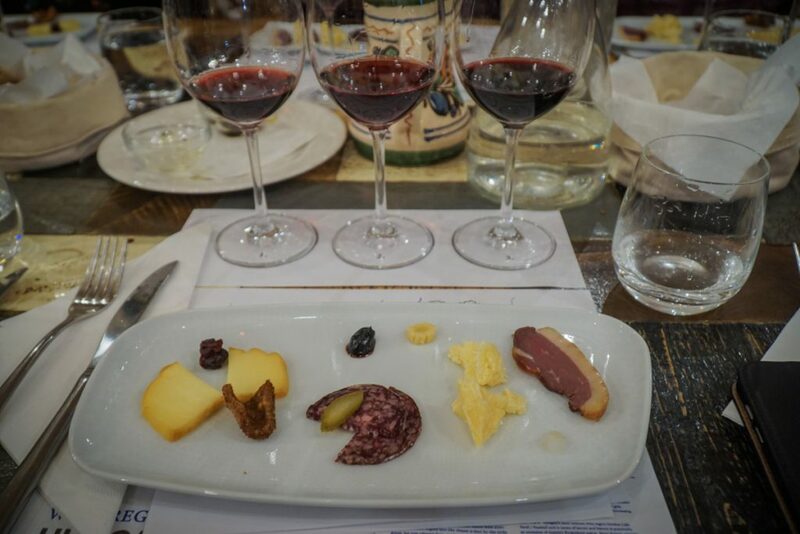 Next, we tried three red wines, which were also delicious and went perfectly with the charcuterie pairings. My favorite of the reds was the Bull’s Blood blend. The story behind the wine’s name is a fun one. The legend goes that during a 16th century battle in present-day Eger, the Hungarians beat the Ottomans much to everyone’s surprise after quite a lot of liquid courage, and the teetotalling Ottomans thought that the Hungarians’ wine-stained faces were painted red from bull’s blood. Whatever the story, I can attest that the wine is certainly delicious. But the real star is, of course, Tokaji, a dessert wine for which Hungary is deservedly famous. And paired with a creamy blue cheese, it’s one of the dreamiest flavor combinations I’ve ever had in my life. Truly, if I could afford to end every night of my life with Tokaji and blue cheese, I would. One of the cutest Budapest Christmas traditions, the winter trams and buses celebrated their 10th year of running in 2018. A simple but adorable initiative, the city wraps several of their trams and buses in literally thousands of LED lights and sends them crisscrossing around the city after dark, brightening everyone’s night. The most classic way to enjoy a winter tram would be to take the Budapest number 2 line along the Danube. They also run on the 4, 14, and 47 lines, but be sure to check the schedule as they don’t actually run on each line every day. This site lists the days and times that each tram runs. You can also find them on a handful of trolleybuses, namely 70, 72, 75, 76, 80A and 83. While on the outside these trams are glowing and charming, they’re also decorated within as well. To get in the holiday spirit and give to those less fortunate, you can make a donation of a gift pack during your journey, which will be given to the Hungarian Red Cross and then distributed to families in need. 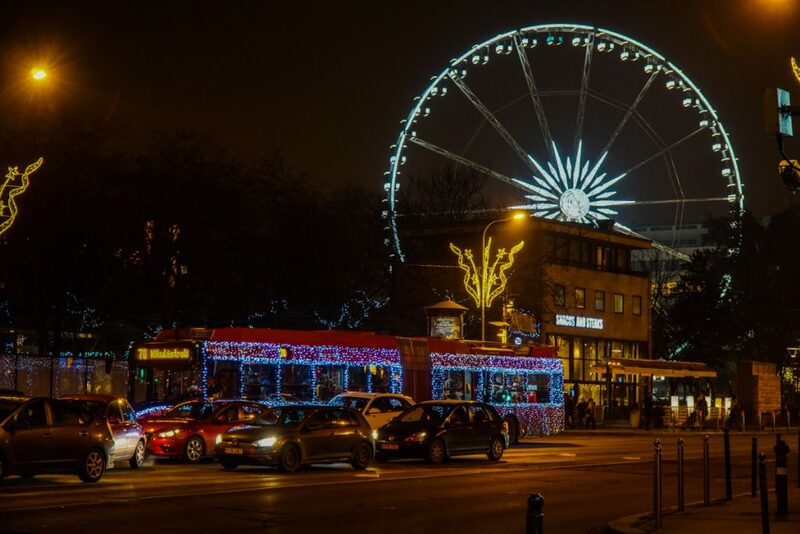 Even better, there is no added charge to take a Christmas tram – it’s just 350 HUF or 450 HUF if bought from the driver (about 1.25-1.50 USD), making it one of the cheapest things to do in Budapest in winter! A true icon of Budapest, if you don’t see the Hungarian Parliament building on your trip, then you are truly missing out. Construction started on the Parliament Building in 1885 and was intended to be finished in time for the 1896 1,000 year anniversary, but it would take 6 more years after that – despite employing over 1,000 workers to build it. The building was inspired by London’s Houses of Parliament, but I think you’d be hard-pressed to find a person who doesn’t find the Hungarian Parliament to be even more beautiful. Since you cannot visit the inside of the Hungarian Parliament without a guide, it’s highly recommended to plan in advance and book a tour, especially if you are visiting Budapest in December when the winter tourist season is at its peak. Tours last 45 minutes, a perfect way to warm up from the cold winter weather and see one of the most beautiful buildings in the world in one fell swoop. Inside, it’s pure majesty – literally, 40 kilograms of gold majesty (my fellow confused-looking Americans, that’s nearly 90 pounds) accenting the intricately-designed ceiling and sweeping staircases. As if that wasn’t enough bling, you’ll also get to see the Crown of St. Stephen, which is constantly kept under watch by two guards who rather dramatically change their swords’ position every 5 minutes. Keep in mind that photos in the Dome Hall are strictly forbidden, so if you want impressive photos of the Hungarian Parliament, it’s best to get them from the exterior. I recommend walking across the bridge to the other side of the Danube and getting your photos near the Batthyány Tér metro stop – this is where everyone goes for their classic Parliament photos. Ruin pubs (also called ruin bars) are a Budapest institution and I think that it’s essential part of any visit to the city. While granted, they have become quite touristy, I think it’s with good reason: there is no real equal to these pubs anywhere else I can think of. Ruin pubs started cropping up in the Jewish Quarter in the early 2000s, which was previously full of abandoned buildings after World War II decimated Hungary’s Jewish population. 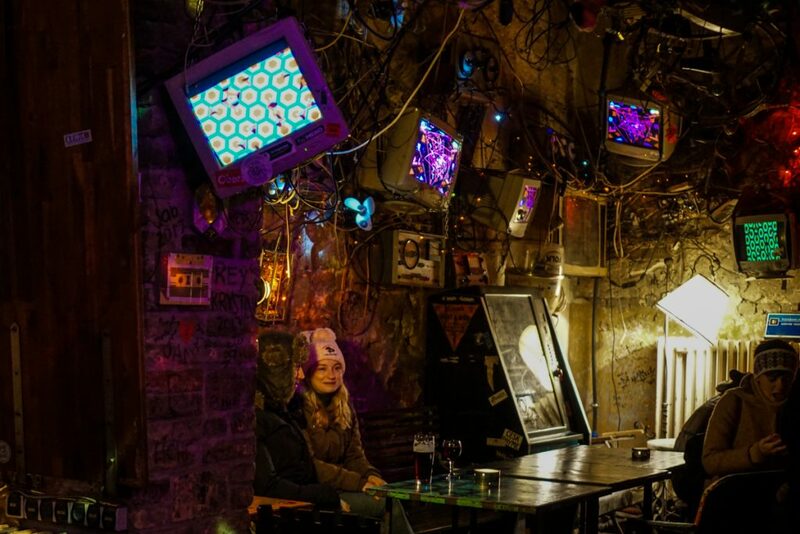 It all started as an experiment of sorts, when some locals took over an abandoned building complex in the area and furnished it with random antiques and junk, selling cheap drinks to a crowd of young forward-thinking people: this would be Szimpla Kert, the first and most famous ruin pub. While Szimpla is easily the most popular, it’s not without its reasons. I spent a good portion of my first summer trip in Budapest drinking cheap wine (literally, the equivalent of 80 cents for a 100 ml glass) and enjoying the shade. 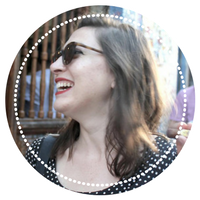 I returned to Szimpla this winter and found it just as cozy and lovely as I did in summer. 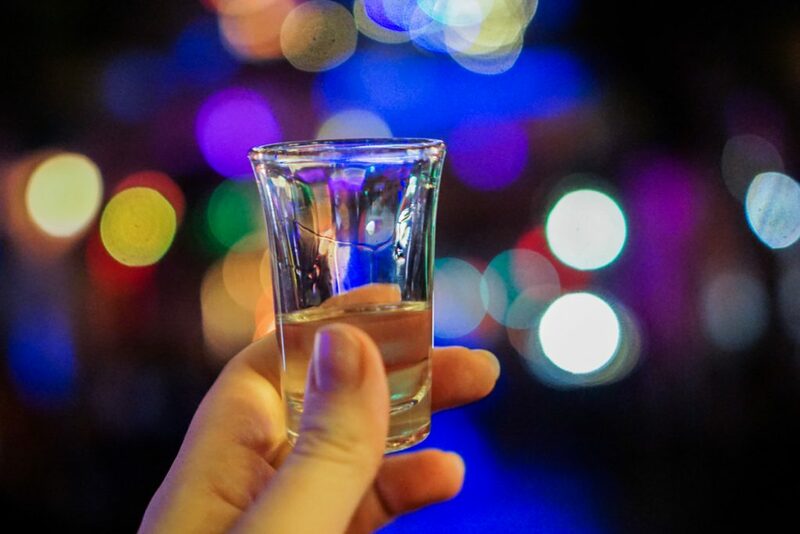 I just kept my coat on but it wasn’t that cold… nothing a short of two of pálinka couldn’t help. If you like shisha/nargile, there are also water pipes available to rent here for about $13-18 USD for a pipe for as many people as you like. One last note: please don’t get too drunk and be respectful of the neighbors when going out in the Jewish District. Many people are leaving their homes because of the horrible behavior of tourists who treat Budapest like a party spot and not like a real city with actual residents. By all means go out and have a good time but know your limits and call it quits before you start acting a fool. 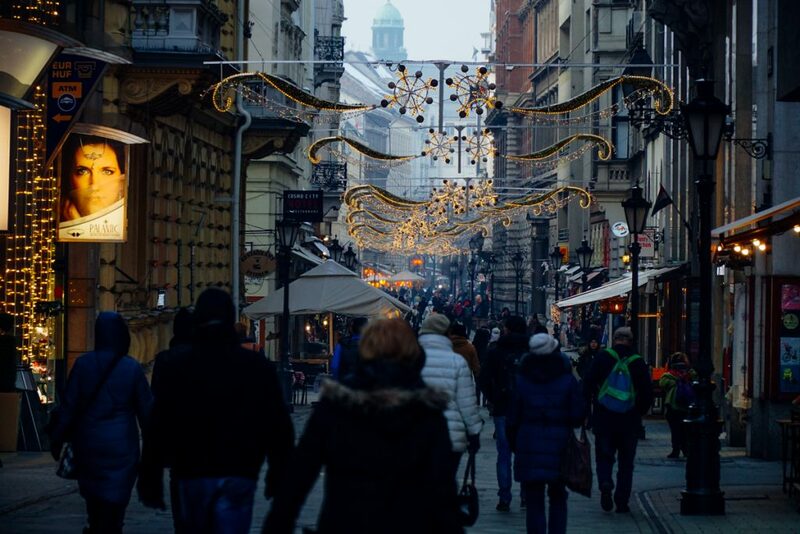 Váci utca (street) is one of the most famous streets in Budapest; in winter, it’s lit up beautifully and decorated cozily, making it a beautiful place to walk (and the fact that you end up at the largest Christmas Market in the city sure doesn’t hurt). While Váci utca is quite touristic (skip the restaurants, cafés, and souvenir shops on this street, as it’ll just be overpriced and low quality) it is still magical, full of beautiful buildings and Budapest charm. It’s well worth strolling, especially all lit up for winter – just resist the people calling you in to eat at their restaurants (travel rule of thumb – never eat somewhere where they have to hire someone to lure people in off the street). 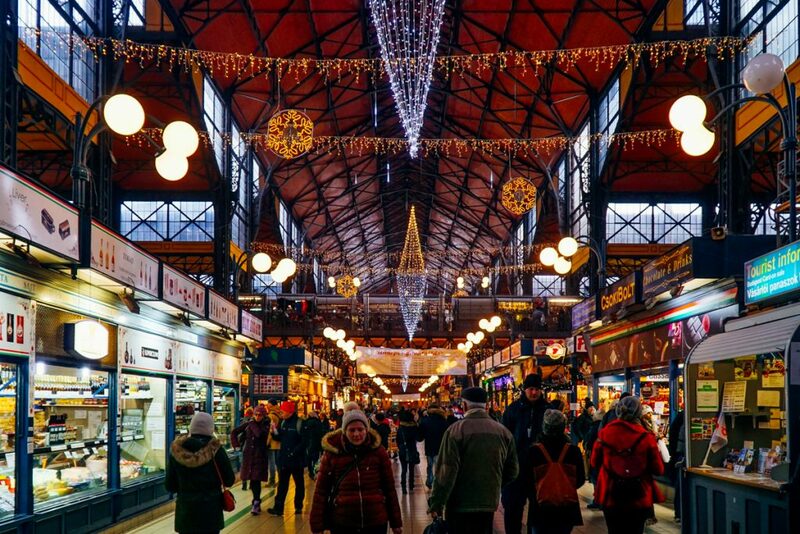 Start at the Central Market Hall (more below) and walk it all the way to Vörösmarty tér. 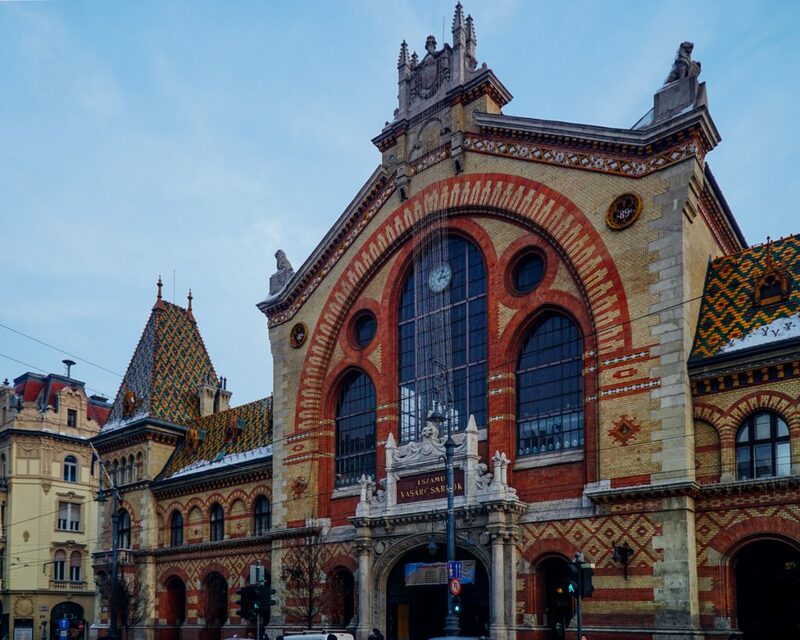 Housed in a gorgeous Neogothic covered market hall building, the Central Market Hall is a Budapest must. 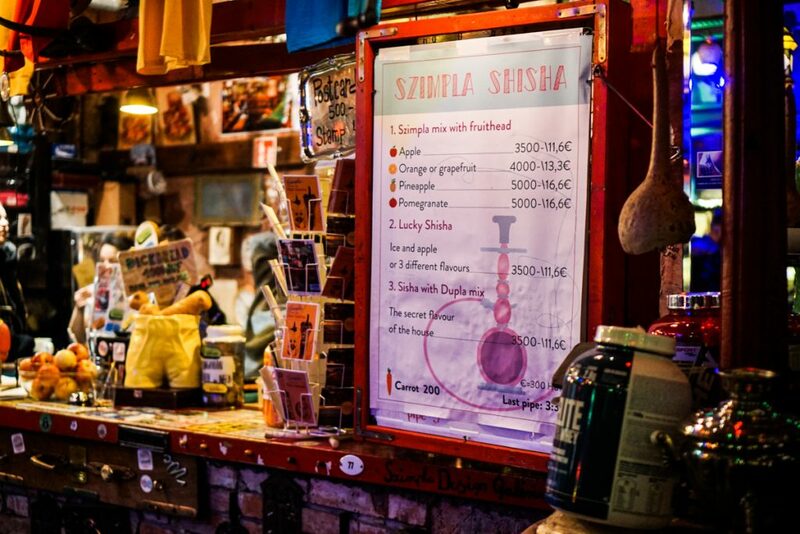 This is the place to go for any souvenirs, edible or otherwise – you’ll get fair prices and fair quality, and the paprika and other spices on offer here are going to be much fresher than you’d find in some random shop on Váci utca. But there’s one main reason why you should visit the Market Hall: rétes. This delicious, flaky strudel sold on the first floor is one of the best pastries that I’ve ever tasted – that sour cherry (meggyes) rétes alone will bring me back to Budapest time and again. Skip the restaurants on the second floor, which are low quality, though the lángos here is passable. Budapest is no stranger to beautiful bookstores. There are several cozy places where you can rifle through shelves full of books (many with plenty of English-language options), which is one of my favorite things to do in winter, in Budapest or elsewhere. Two of my favorites are both in the Jewish District: Atlantisz Book Island, which has plenty of new books and a gorgeous layout, and Massolit Books & Cafe, which has a smaller selection of English-language books but also a cute café (and super Instagrammable doors). Yellow Zebra near the Hungarian State Opera also has a nice selection of used books. Like so many countries in Central and Eastern Europe, Budapest’s Jewish population was forever changed by the Holocaust. The Jewish District, formerly the Jewish Ghetto, was largely depopulated for the second half of the 20th century and only started experiencing a revival in the last 20 years. While the Jewish District’s revival has been primarily driven by tourists, the preservation of this part of Budapest’s history is important. One of the best ways to ensure that the district continues to preserve its history is by visiting its synagogues. 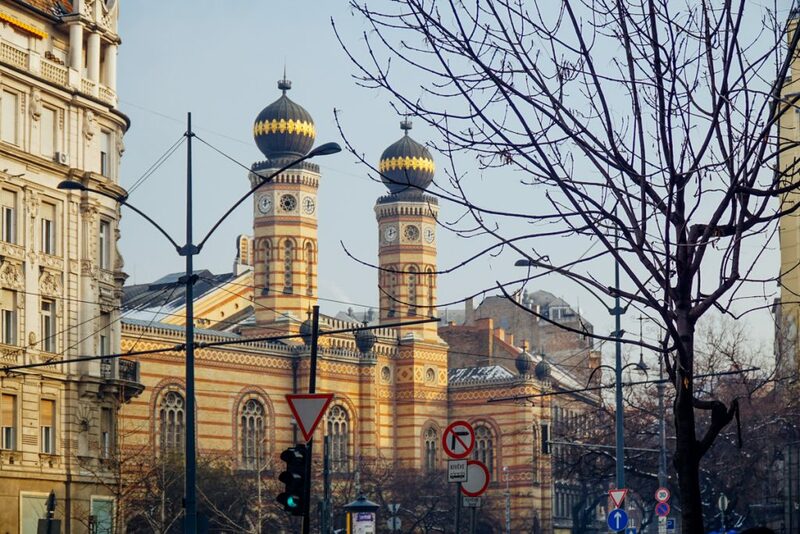 In particular, don’t miss the beautiful Dohány Street Synagogue, the largest in Europe and the second largest in the world, fitting nearly 3,000 people inside. It was built in the 19th century, primarily in the Moorish Revival style, but also incorporating Byzantine, Romantic and Gothic design elements. After the Holocaust decimated Budapest’s Jewish community, the Dohány Street Synagogue fell into disuse. After the fall of communism, It was renovated extensively in 1991, which took nearly 5 years (the same amount of time it took to build, incidentally) to finish. Now, it welcomes tourists throughout the year. While the price of admission is rather high, especially for Budapest which is largely pretty affordable, it goes towards ongoing renovation work and ensuring that this beautiful, resilient historic building can be enjoyed by all in the future. 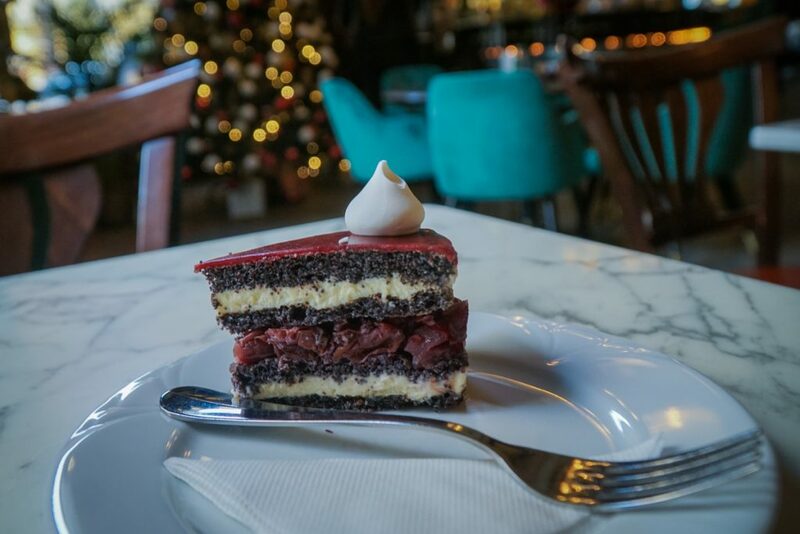 One of the most can’t-miss things to do in Budapest in winter is eating a delicious (but expensive) piece of cake in one of its iconic coffee houses. There are two popular, classic options: New York Café and Central Café. 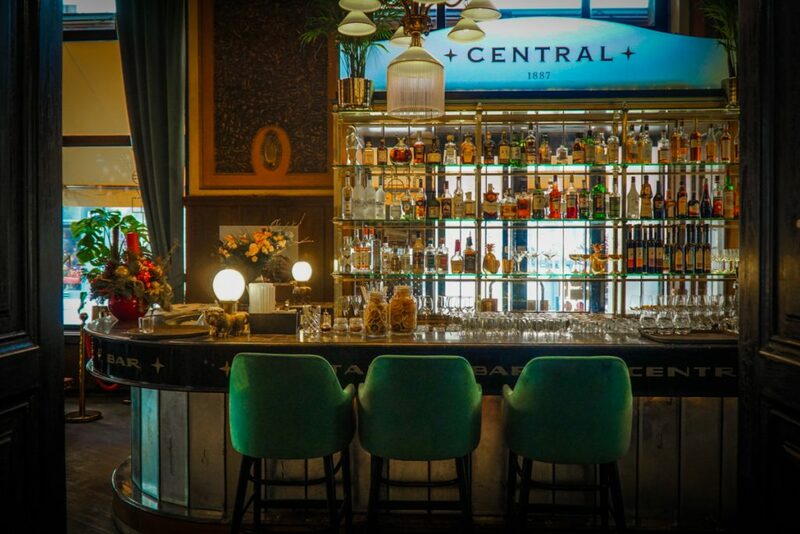 Both are exquisite: the New York Café looks more like an ornate chapel with beautifully painted ceilings and architectural details, whereas the Central Café has a more understated yet elegant charm. I had a delicious sour cherry and poppy seed cake and a perfect cappuccino at the fin-de-siècle-era Central Café during my recent trip to Budapest, while a jazz band played softly in the background. It was the perfect way to rest my legs and warm up a bit, and I mean – look at the surroundings. It was well worth the hefty price, which was about $10 USD for a cake and coffee. Does a river cruise seem like a summer-only thing? Luckily, in winter Budapest’s riverboats are enclosed and heated, creating a warm and cozy atmosphere even on the most miserable winter days. 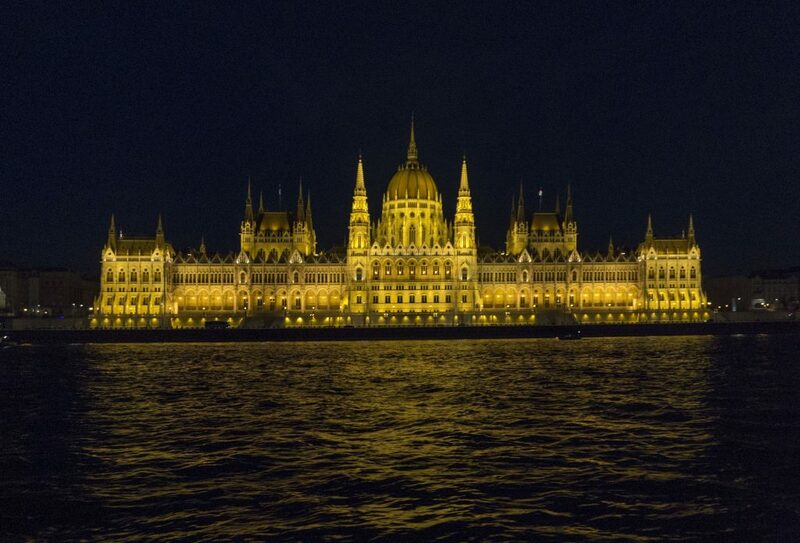 The most magical way to experience the Danube is at night, lit by candles and with live music in the background as you pass by sites as beautiful as the Hungarian Parliament, the Gellért Baths, and the Széchenyi Chain Bridge, all of which get an extra beautiful glow at night. You can book a beautiful 2.5 hour dinner cruise here. 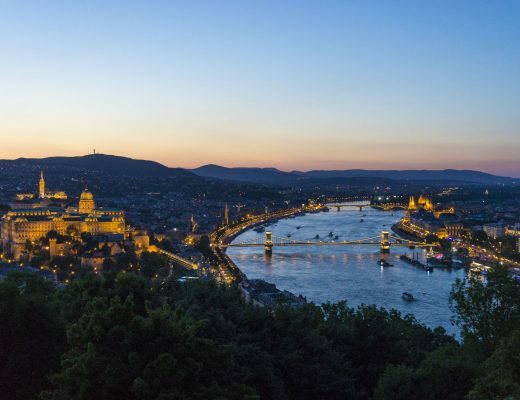 If you’re on a budget, don’t worry, a river cruise isn’t out of reach: you can do a simple 1-hour sightseeing cruise with a welcome drink for an extremely affordable price. 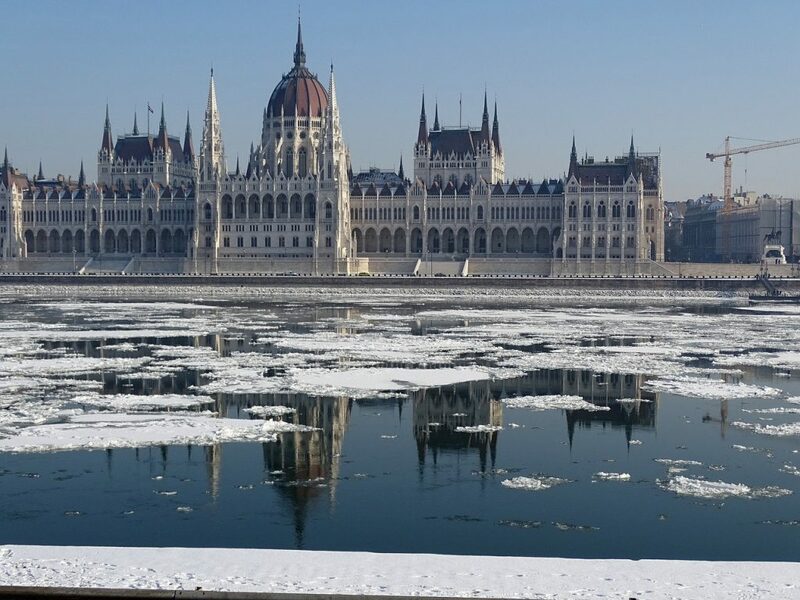 Planning a trip to Budapest in winter? Pin this for later! Note: I received a complimentary food tour and wine tasting class from Taste Hungary. All opinions expressed and pounds gained are entirely my own.